Carrie Kissman (Biology) and Maria Dzurik ’13 take samples at the college marina. The Fox River Valley has long been a locus for manufacturing, in large part because of its proximity to water, but as a team of St. Norbert researchers has shown, the relationship between industry and the river that runs through it can also make for an intriguing area of focus when it comes to environmental studies. 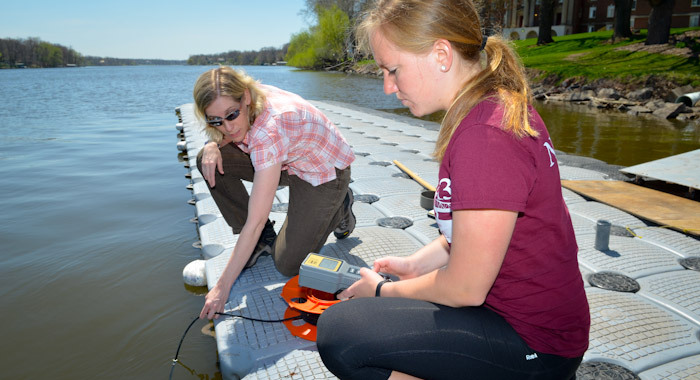 In the summer of 2012, Carrie Kissman (Biology) and student fellow Maria Dzurik ’13 tested water quality, clarity and invertebrate species diversity at three different points along the Fox River. Polychlorinated biphenyls (PCBs) were originally introduced into the Fox River by paper mills and other industries and, as a result, have had negative effects on fish and plant life in the Fox River. According to Dzurik, PCBs are also linked to other biological issues. They can have negative impacts on aquatic ecosystems and, if pregnant women eat affected fish, birth defects are known to be caused. One of the largest environmental dredging endeavors undertaken in the United States, the Fox River remediation project officially began in 2000, with the intent of addressing this issue and reducing the risk to human health and the environment by removing contaminated sediment from the riverbed. Dredging and capping began in 2009. The faculty-student team researched upstream, downstream and at the dredging site in order to analyze the effects of this dredging on the number of invertebrates present. According to Kissman, their research also assessed if other aspects of the dredging such as sediment and nutrient resuspension affected the river ecology. Kissman and Dzurik’s findings support their hypothesis that the dredged site would have lower species diversity compared to the upstream and downstream sites. invertebrate species diversity was significantly lower at the dredged site compared to upstream and downstream sites, but water quality differed from the dredged site and upstream site only. (There was no difference between the dredged site and the downstream site.) The water clarity results were less conclusive. To view the full methodology as well as detailed findings of this research project, download the collaboration poster (PDF). 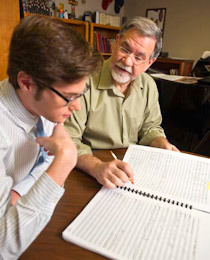 In labs, studios and scholarly settings across campus, students find opportunities to collaborate with professors on research that matters. St. Norbert College celebrates these relationships: In fact, they are the focus of an annual showcase and celebration.